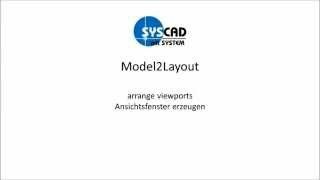 This application is used to generate horizontal and vertical viewport sequences from the model space into the layout area. The time-consuming positioning of the viewports in the layout-space is done by this program. A function is used to generate viewport references from the layout - viewports into the model space. In the model space, these viewports are represented by rectangles on a specific layer. This reference allows you to change the position of the drawing objects in the model-space and to update the layout-space. Functions for locking and unlocking the viewports - freezing and thawing of the viewport-layers are also included. This app saves so much time when creating layouts for our duct drawings. I only wish it was updated to 2019, we're having to keep 2018 installed to use this while we do everything else in 2019.
simple app and great time saver! I would love this for Civil 3D! !